Manipur University is under siege by armed forces. Many students and faculty members are under judicial custody. What follows is a narration of a series of complex events leading to the armed action in Manipur University. Michael Samjetsabam argues that ethnic tensions dented the University movement, not entirely, but to some extent. The author also writes about the BJP’s attack on the University in a bid to put an end to the brewing anti-fascist resistance there, particularly after it’s design to control the university failed. 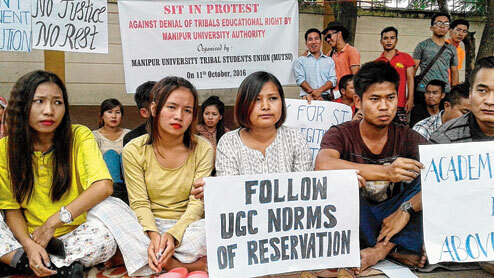 Click here to read the author’s earlier account of the Manipur University strike. 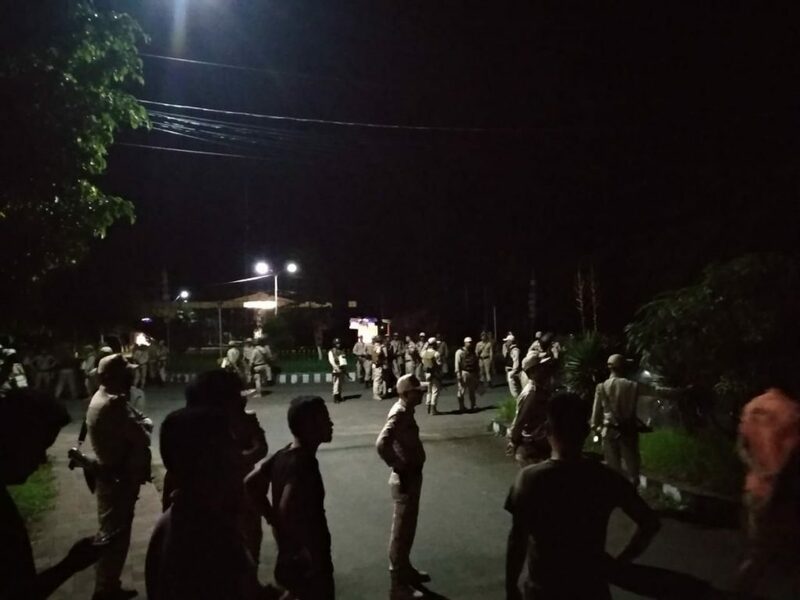 A large number of armed forces, police and paramilitary, have entered Manipur University on the early hours of 21st September. The university is under a military siege. There are armed forces and military vehicles stationed in the university. Armed forces came inside the university at midnight and carried out “search operations” in both boys’ and girls’ hostels. They fired tear gas shells, rubber bullets and blasted mock bombs in the university, injuring many students when they opposed the raids. Police have arrested six faculty members and eighty-nine students. They are in judicial custody now. The pro-VC has suspended the faculty members. Now armed forces have taken over the hostels, forcing the students indoors. Injured students have not received medical attention, armed forces are not allowing anyone to leave or come inside the university. The state government has banned mobile internet services in Manipur for five days starting from 22nd September, to hide its brutal crackdown on the university. According to Manipur Police, the Provisional VC, Y Yugindro, faced a gherao when he entered the campus with a large number of security forces on the 20th of September. The Pro-VC, after facing opposition from students and faculty members, went to the Chief Minister’s office and narrated the incident. He told Impact News that CM wanted to take action, given pressure from the Center on the matter. The CM, according to the ProVC, said that the “Center is scolding me”. So he gave a list of names who are active in MUTA, MUSA and MUSU to the CM. Police took up the complaint and filed FIR against 31 students and faculty, under sections 365, 342, 307, 506, 384, 120B, 34, and 7 in the Criminal Law Amendment Act, 1932. 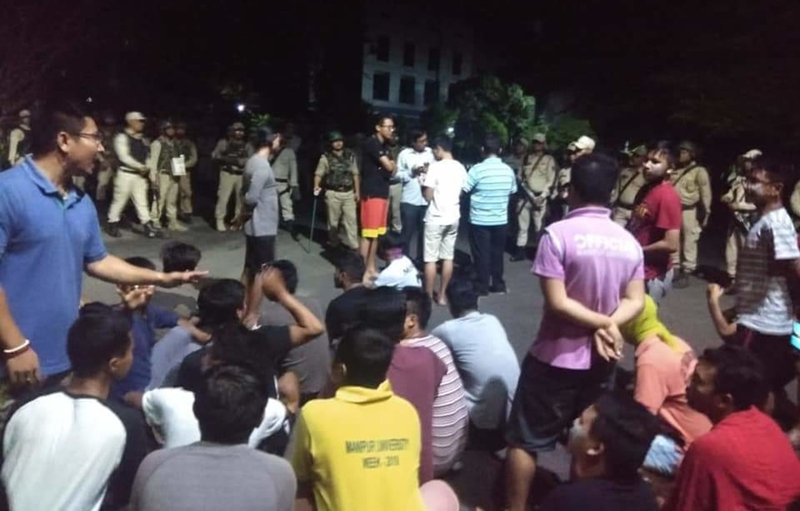 Police and paramilitary raided the campus, arresting individuals and office bearers of Manipur University Students’ Union (MUSU), Manipur University Teachers’ Association (MUTA) and Manipur University Staffs’ Association (MUSA). Students alleged that the government carried out armed action in the university to destroy evidence incriminating the suspended Vice Chancellor Adya Prasad Pandey. 6 faculty members and 89 students have been arrested by the Police. When Delhi Police entered JNU and arrested Kanhaiya Kumar, the academic world felt violated. Now as we are witnessing a military siege in Manipur University, their selective silence is deafening. The movement started on the 31st of May with the demand for removal of VC Adya Prasad Pandey. Students alleged him of committing corruption in appointments and purchases, and saffronisation of the University. The movement started during a time when BJP’s contradiction with the Meitei population in Imphal Valley was getting sharper and sharper. The border dispute between Manipur and Myanmar and the role of the Indian state had become a heated matter. People in the Imphal Valley alleged that the position of Border Post Number 81 was wrong. They claimed that Indian officials have given up Manipur’s territory to Myanmar. BJP Manipur Pradesh discovered its inability to convince its masters in Delhi to work out a solution in the interest of the people of Manipur. Another significant development that goes against the Hindutva project of integration, was the passing of Manipur People’s Bill 2018. The bill protects the land and resources of the indigenous communities living in present-day Manipur. For the first time in recent memory, Meitei, Meitei-pangal, Naga, Kuki and other indigenous communities came together for the bill. Now it is waiting for Governor’s approval. Lastly, the movement in Manipur University was turning into an anti-BJP movement, given the alleged relations between BJP and VC Pandey. These movements had received massive support in the Imphal Valley. Given that half the population of Manipur stays in the valley, BJP seemed worried. Students organisations in the Valley did not support the just demands of reservations for tribal students. This politically regressive blunder on the question of social justice has cost the movement in Manipur University. These developments go against the Hindutva integration project of the rulers in mainland India. BJP now must act to counter it. Recently, RN Ravi, the interlocutor of the peace talks between Nagas and the Indian State, revealed that he had suggested the extension of Article 371(a) to Manipur, as part of the peace accord signed between the National Socialist Council of Nagalim (IM) and the Indian State. The act upholds Naga customary laws, land ownership and the Naga way of life in Nagaland. According to Meiteis of Manipur, Article 371(a) is specific to Nagaland. The Meiteis claim that present-day territory of Manipur and Nagaland have different histories. They have been protesting against the proposed cultural expansion from Nagaland into Manipur. The ethnic tensions between Nagas in Manipur, and Meiteis boiled up. The timing of the revelations about the Naga Peace Accord reveals the motivation. The rulers in the mainland India want to use this conflict for their own political gains. The charged ethnic tensions between Nagas and Meiteis, surely enough, spilled over into Manipur University’s movement regarding the removal of the VC. This of course in addition to the University’s own political misdeeds. Manipur has a large tribal population of around 34 per cent. This is more than the national average. Tribal student bodies have demanded 31 per cent reservations for tribal students in the University, as opposed to the 7.5 per cent reservation the University fixed after becoming a central university. Protests in the University over this matter continued for months and months in 2016. Students organisations in the Valley did not support the just demands of the tribal students. This politically regressive blunder on the question of social justice has cost the movement in Manipur University to some extent. All Tribal Students’ Union Manipur (ATSUM), citing non-participation of the valley-based student organisations in the reservation struggle as the reason, did not take part in the movement for the removal of the VC. It did not support the VC, but it had decided not to participate. It demanded the government to resolve the matter so that students can resume their studies. BJP made attempts to exploit further these tensed ethnic relations already steeped in the University, and related developments happening in Manipur around that time. The timing of the revelations about the Naga Peace Accord reveals the motivation. The rulers in the mainland India want to use this Naga-Meitei conflict for their own political gains. The charged ethnic tensions between Nagas and Meiteis, surely enough, spilled over into Manipur University’s movement. The Chief Minister under pressure proposed an inquiry committee to find the truth about the allegations against the VC. The committee consists of T. Nandakumar (former Chief Justice of the High Court of Meghalaya), (UGC Joint Secretary) JK Tripathi and (MHRD Deputy Secretary) Surat Singh. All Tribal Students Union Manipur and other tribal organisations appealed to the bodies in the University to accept the enquiry committee so that normalcy returns to the University. However, Manipur University Students’ Union, Manipur University Teachers’ Association and Manipur University Staffs’ Association opposed the three-member committee saying that the two members from MHRD and UGC are very close to VC Pandey. MUSU, MUTA and MUSA demanded a change in the composition of the committee. Joint Tribal Student Bodies (JTSB) which includes student organisations from four tribal communities, came out in support of the VC. When Manipur University Student Union called for an all Manipur Bandh demanding the removal VC Pandey, JTSB called an indefinite national highway economic blockade supporting VC Pandey, on the 6th of July. It lasted for a day. It also organised a protest in Delhi along with ABVP, the students’ wing of the RSS. ATSUM released a statement saying that it is an apex tribal student body and it does not recognise the JTSB. Over time, further wedges have appeared, even between tribal organisations. Rallies appeared in different parts of Manipur to bring back normalcy in the University with BJP members leading them, on the 6th of August. 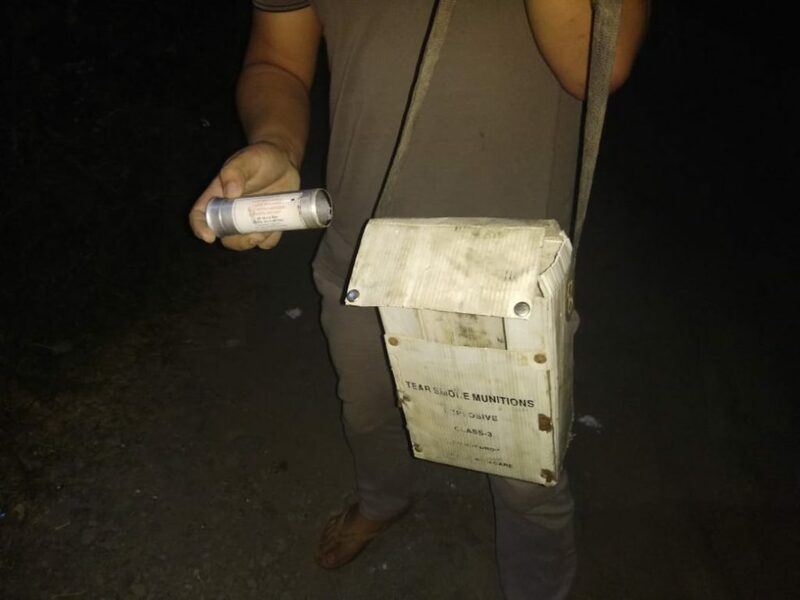 On the same day, supporting the protesters outside the gate of Manipur University who were demanding the calling off of the shutdown, Manipur Police attacked the University with tear gas shells. The pressures on MUSU, MUTA and MUSA were also rising. The university was under lockdown for more than two months. Everything had stopped even in the eighty-nine colleges affiliated to it. Finally, MUSU, MUTA and MUSA sign a memorandum of agreement (MoA) with MHRD officials in the presence of CM Biren Nongthombam. The MoA states that an independent enquiry committee consisting of two members would look into the matter. T Nandakumar from the earlier constituted committee and Mihir Kanti Chaudhuri, who is an advisor to the Department of Education in BJP-ruled Assam, constitute the new committee. Though the stakeholders were not happy, they accepted. The MoA includes the agreement that the VC will be on leave during the period of enquiry. Finally, normalcy got restored after 85 days of total shutdown. But peace, as usual, did not last for long. MHRD appoints Professor Vishwanath Waikhom as the VC in-charge of MU on the 2nd of August. According to MoA, Pandey should be on leave till the end of the enquiry. The registrar granted the leave till the 1st of September contrary to the agreement. This violated the agreement between MUSU, MUTA, MUSA and the MHRD officials. Pandey resumes office on the 2nd of September, arguing that he did not know the contents of the MoA. Furthermore, he explained that the enquiry against him had not started. Just before Pandey had resumed office, a confidential document took rounds in social media – an agreement between MUSU, MUTA and MUSA. It mentioned that whoever becomes the VC, from those who took part in the movement, should immediately remove the stooges of BJP and VC Pandey from their administrative positions. Meanwhile, six Meitei and one tribal faculty members were removed from their administrative positions. The BJP called this a violation of the MoA. ATSUM argued that instead of removing Pandey the movement ended up removing a tribal faculty member. However, these arguments failed to dent the movement in Manipur University to the extent the BJP thought it would. VC Pandey still could not enter the University, so he set up his “transit office” in a high-security zone in Imphal. Now the University has two Vice Chancellors. When students went to seek clarification on the matter, police arrested twenty-two students including the General Secretary of MUSU, at Pandey’s office. The VC then, while under an enquiry, appoints Y Yugindro as a Provisional VC, on the 10th of September. Faced with massive hue and cry over Pandey coming back in direct violation of the agreement, and the arrest of the students, President of India, who is a visitor to Manipur University, suspends VC Pandey from his duties on the 17th of September. Given the contradictions brewing between the people of Imphal Valley and the BJP, Pandey seems to have finally become a problem for the BJP. But anti-BJP activities would not be tolerated any further. Y Yugindro, who is now the Pro-VC, entered the university on the 21st of September with armed forces, faced with opposition from MUSU, MUTA and MUSA. The University community claim that Pandey, while himself under investigation, appointed the pro-VC without ratification from the Executive Council of the University, in clear violation of the Manipur University Act. The students gheraoed him. Immediately as he left the University after apologizing to the students, police raided the University. The armed action is clearly an attempt to destroy the anti-BJP movement which was building up in the University around Pandey. VC In-Charge Vishwanath Waikhom condemned the armed action in the University. Congress, Communist Party of India and other parliamentary parties in Manipur, have condemned the arrests of students and activists inside the University. Civil society organisations, different student organisations and women organisations have threatened massive protests in the state if the government does not release the arrested students. Joint Students’ Coordination Committee of Manipur (JSCC) called for a total shutdown of the University, and has organised protest demonstrations in Imphal in response to the police crackdown. Manipur University Students’ Union (MUSU) has called for boycott of examinations. The turmoil has returned. As expected, mainstream media is silent over it, and so are the liberal mainland Indian academics and intellectuals. When Delhi Police entered JNU and arrested Kanhaiya Kumar, the academic world felt violated. Now as we are witnessing a military siege in Manipur University, their selective silence is deafening. The author is a research scholar at IIT Mumbai. Photos and videos, unless otherwise mentioned, are courtesy author.